I didn’t know that Mazatlan, Mexico was known for tequila. In fact, I knew for sure that they didn’t make tequila. The reason is that Mazatlan is in the Northern Mexican state of Sinaloa. “Tequila” is a legally protected term that can only be used for spirits made in the Central Mexican state of Jalisco. 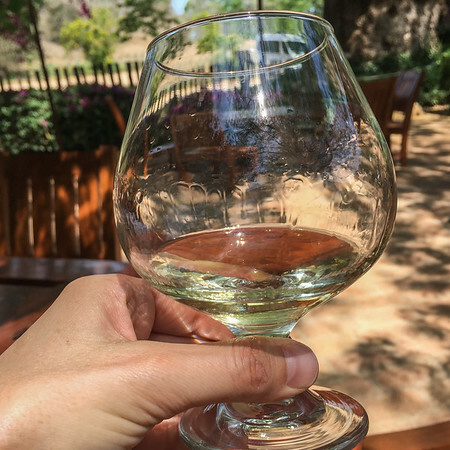 Tequila is a big business in Jalisco–I remember traveling around the state by bus many years ago, watching endless fields of spiky grey “blue agave” plants, the sole ingredient in tequila. I didn’t realize that the succulent was also grown way up in Sinaloa. I was proved wrong on my recent trip to Mazatlan — it is. The catch is that local makers just have to label the spirit something other than tequila, like “100% blue agave” or “aguardiente”. 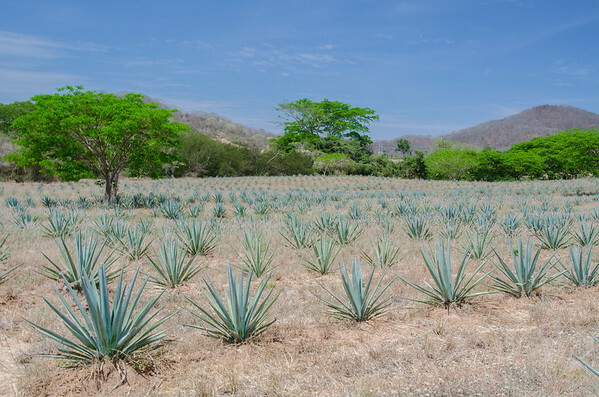 Blue agave fields at the Los Osuna Distillery in Mazatlan, Mexico. Despite not being in the heart of the mainstream tequila industry, the Mazatlan area has some serious boozy cred. They have two world-renowned, award-winning local tequila makers–one is a woman-owned craft spirits maker who, in addition to working with blue agave, is doing some creative things with mangos. Both distilleries give free public tours. 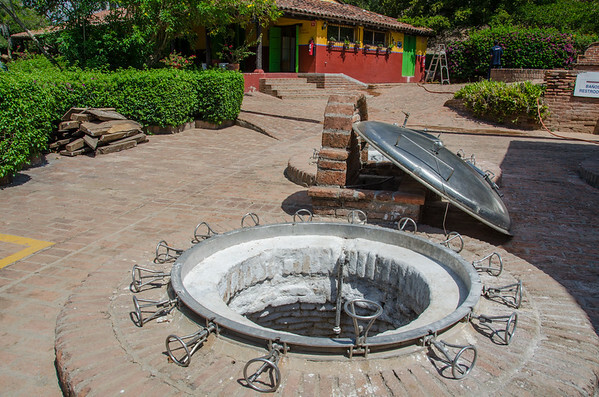 The Los Osuna Distillery (Vinata Los Osuna) is a family owned distillery in the small town of La Noria, Sinaloa (about a 45 minute drive east of Mazatlan. The Los Osuna family has been making agave spirits on the property since 1876. 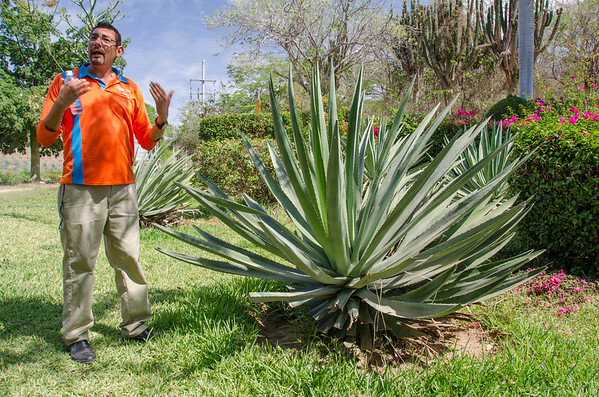 Our guide, Julio, walked us around the property and we got to see, step by step, how tequila is made. A single blue agave plant takes from five to eight years to mature. When ready, the agave field worker (jimador) slices off the long, spiky leaves and removes the juice-filled heart of the plants. The mature heart (called a piña, because it looks like a pineapple) weigh from eighty to three hundred pounds. It takes about 15 pounds of piña to make just one liter of agave spirits. On our walk through the distillery, we learned how tequila is made. 1. Cooking. First, the fruit is cooked in a steam filled stone hole. 2. Extraction of sugars. 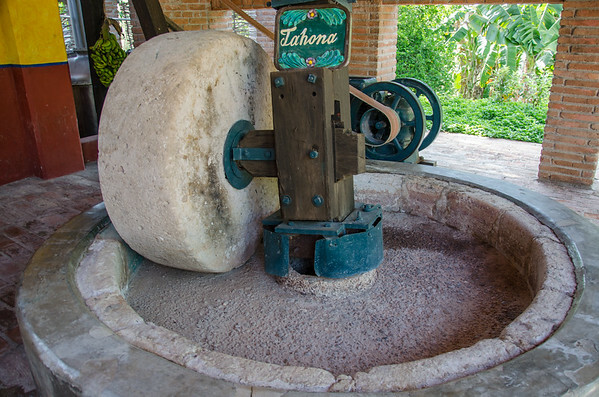 In the past, the cooked juice mash was run through this giant stone press, drawn by mules. 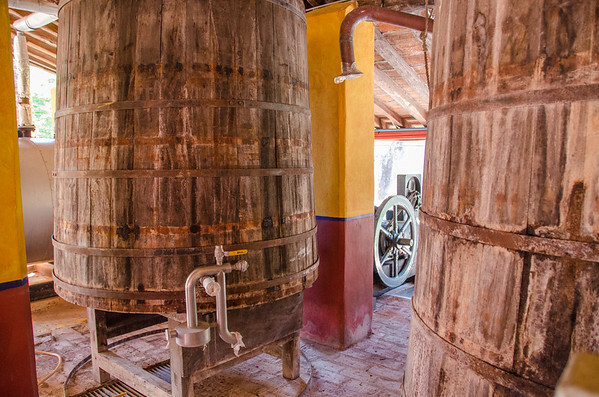 Today, Los Osuna uses modern mechanical presses to extract the liquid, but they keep the traditional devices around to share the history. 3. Fermentation. The juice is left to ferment for four days in giant oak barrels. 5. 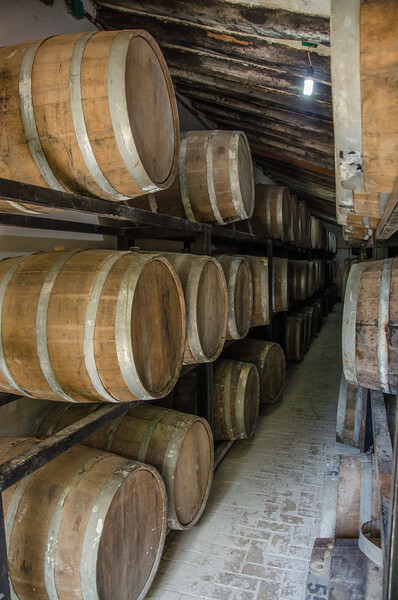 Barrel aging in French or American oak barrels. Reposado or maduro (“rested”) tequilas are aged in barrel for 11 months, and añejo (“aged”) tequilas are left for 3 years in barrel. The longer the contact time, the darker the color and stronger the oak flavors in the final product. The tour got me anxious for the grand finale–getting to try all three of the Los Osuna agave spirits: blanco, maduro, and añejo. 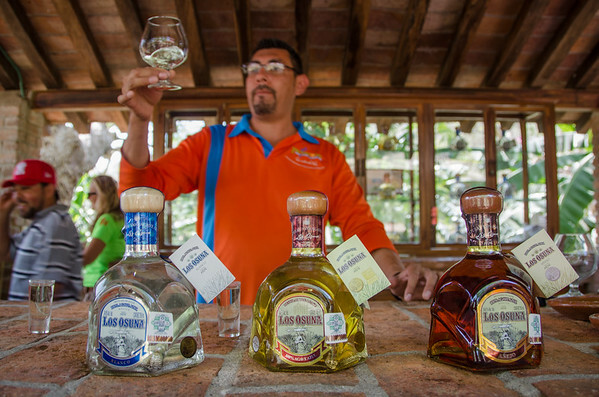 Even if it can’t be branded as tequila, Los Osuna recently surprised the global liquor world by winning three medals in the tequila category at the prestigious San Francisco World Spirits Competition. In another tequila competition in New York City, their Maduro won a double gold medal. I admit to not being a very experienced judge of booze (I’m a craft beer fan, you know) but I enjoyed all three of the easy-drinking spirits. TEQUILA TASTING TIP: Try smelling the tequila, one nostril at a time. Many people sense different aromas with different nostrils. 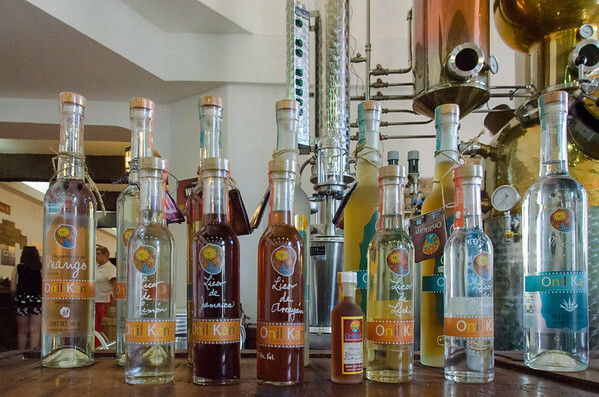 Onilikan makes two different distilled spirits, a tequila (that they opted to call “Blue Agave Aguardiente”) and a Mango Aguardiente. The interesting thing here is that their Mango Aguardiente is not a mango-infused spirit. It’s a pure spirit made from whole mangos (skin, pulp, and all). In fact, Onilikan is the only company in the world making a distilled spirit from mango fruit. We toured around the shop with the founder, Maria Victoria Campos. Campos was joined in this project by her brother, a scientist who lives in Calgary, Canada. 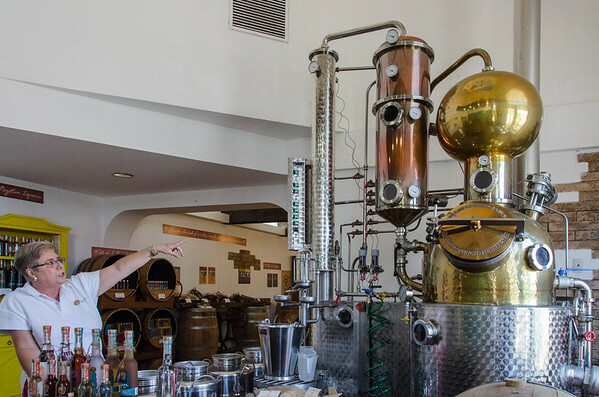 The pair decided to open the distillery as a retirement project after he spotted a beautiful, German made copper still at a distillery in the Okanagan Valley of British Columbia. The team wondered whether it could be used to make spirits from Mexican fruit, thus their idea was born. They procured one of those German stills, that they affectionally named, “Dora” (which is short for destilidorada, the Spanish word for the device). And it’s been a success. 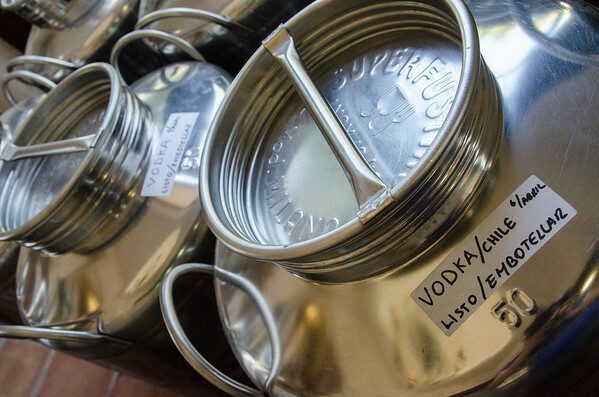 They won two medals at the 2012 World Spirits Competition in San Francisco. They also make a variety of infused liquors (using the mango aguardiente as their base) flavored with mango, mandarin, lychee, and hibiscus flowers (jamaica). The coffee liquor (one of my favorites) actually needed a stronger spirit so that one was made with a grain alcohol. On the day we were there, they were also experimenting with a chile infused vodka. After a brief walk around the shop–Campos stocks some really interesting local craft food products that make great gifts–we sampled her whole line. The mango aguardiente has a subtle flavor of the fruit and would be great on the rocks. The mandarin, hibiscus, and coffee liquors were my personal favorites. The Los Osuna distillery is in the town of La Noria, Sinaloa, on the highway Carretera a La Noria/Sinaloa El Habal-La [map]. It’s about a 45 minute drive from Mazatlan. If you don’t want to drive, you can add it to any local tour itinerary. I highly recommend Julio Cervantes, from Pronatour Mazatlan. I was a guest of the Mazatlan Hotel Association. All opinions and photos are my own. I’ll be in Mazatlan in a few weeks and would love to experience this tour at Los Osuna…how did you go about making reservations for the tour/tasting? Did you go through a tour agency or call the establishment themselves? Any advice or recommendations are appreciated!